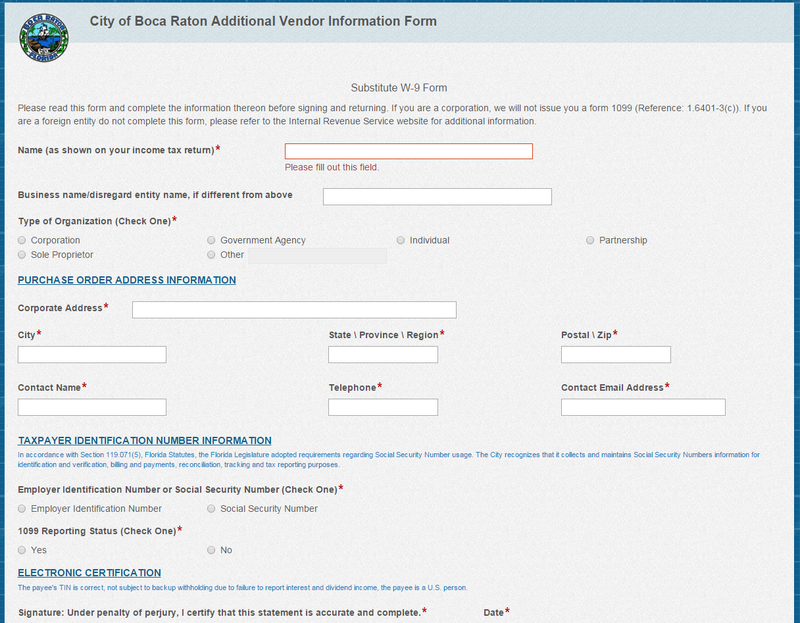 All new technology projects at the City of Boca Raton, FL, follow an eight step implementation strategy. Here is how the City automated its accounts payable process with Laserfiche Forms and Laserfiche Workflow. Before automating their first process, the Lean Team participated in a general training about lean process improvement that was led by the City. Potential projects are prioritized after they are received. The City tackles the most visible projects, such as the accounts payable automation process, first. These processes affect many staff members, so automation has the greatest impact in these areas. More employees are able to see a tangible benefit and therefore get on board with the project. Once the accounts payable process was selected, the Lean Team participated in a “Kaizen” event during which they looked for as many improvements to the accounts payable process as possible. Afterwards, the team held a kick-off meeting with various representatives from departments throughout the city to discuss the overall team goals of the project, the project charter and scope as well as identify stakeholders. This was the most time-intensive part of the accounts payable project. During this phase, the Lean Team mapped out the existing process on the wall with sticky notes. Every step, no matter how small, was included. Once the process was mapped out the team evaluated each step and asked if it was value added. 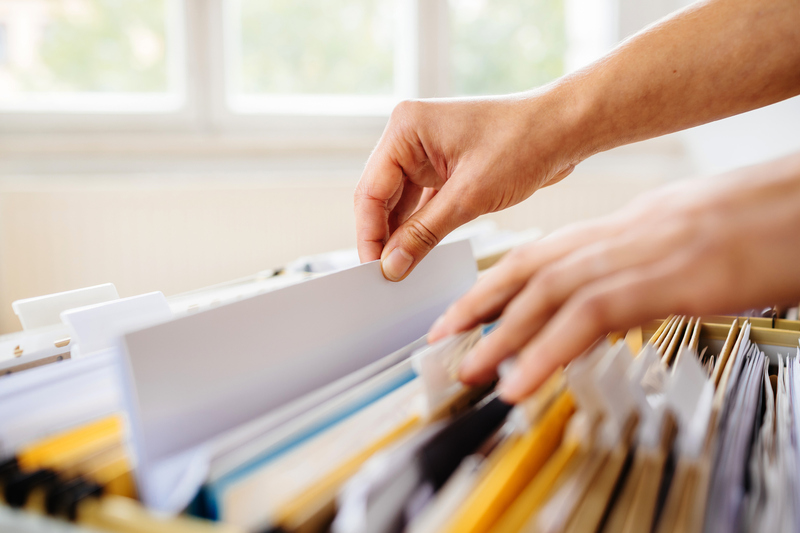 Non-value added activities such as walking a file to someone’s office or obtaining three different signatures were identified as waste and discarded. 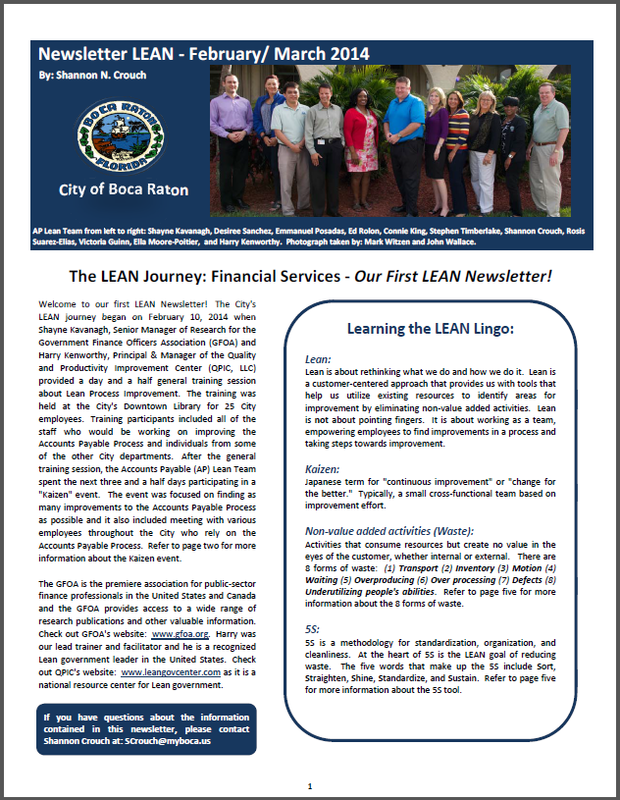 During the discovery process, the steering Lean Team communicated with the rest of the city through monthly newsletters outlining the progress to help generate buy-in from stakeholders for eventual change. Before doing business with the City, a vendor must fill out an Additional Vendor Information form on the Boca Raton website. The form is automatically saved in Laserfiche, and Laserfiche Workflow sends an email to the vendor confirming the form submission. Another automatic email is sent to the accounts payable manager who is also notified of the new form submission. Accounts payable staff verifies whether the company is incorporated and, if the verification is complete, the accounts payable manager generates a vendor record in the financial system, SunGard NaviLine. 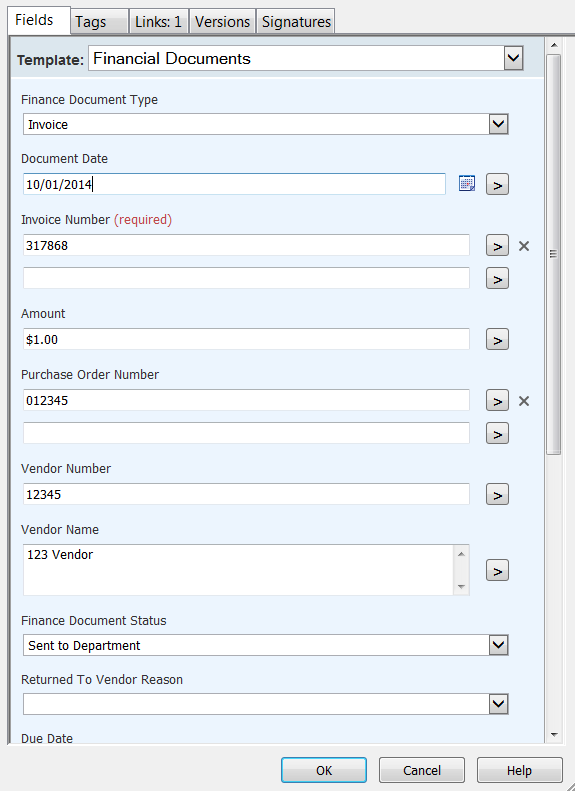 The accounts payable manager opens the form’s metadata and populates the vendor number. She also selects “Completed” from the form status field. If the state of incorporation validation is not successful due to incomplete information, the accounts payable manager enters the reason why the form is incomplete in the comments field and selects an “Incomplete” form status. 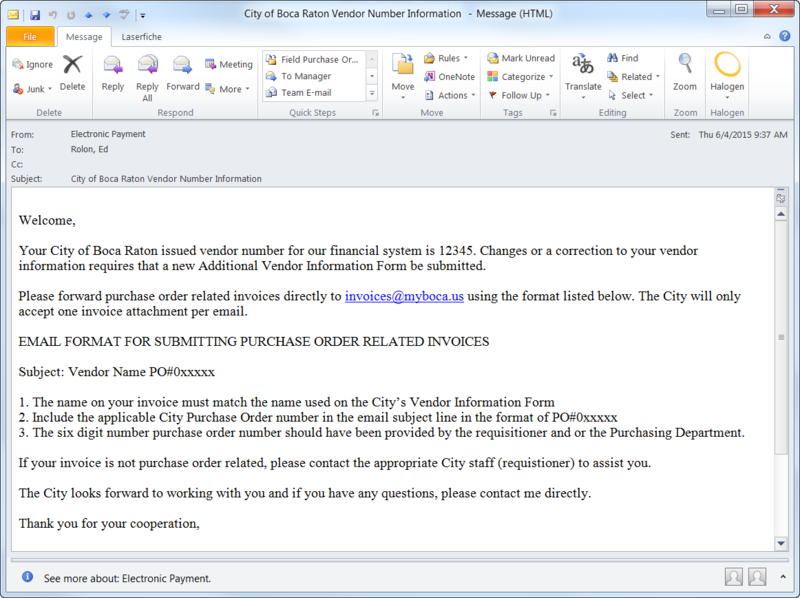 A vendor number and instructions on how to forward invoices to the City. 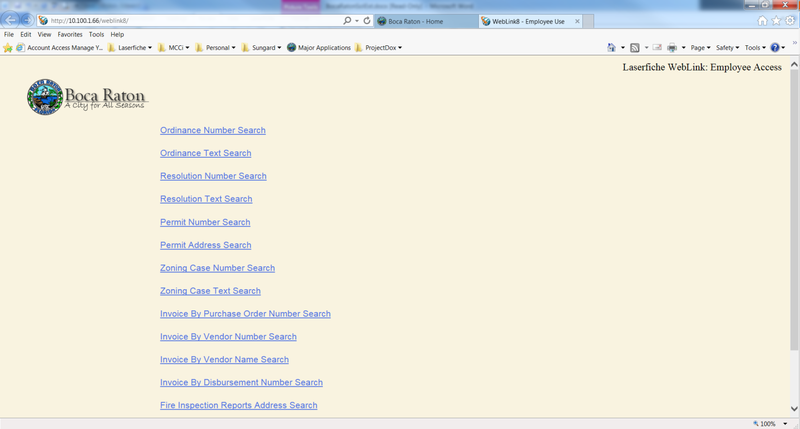 A notification that the form is incomplete and the reason why along with instructions for resubmittal. The vendor sends an email with the invoice attached to a specific email address. The email subject line identifies the vendor and purchase order number. The accounts payable clerk drags and drops the email into the “Accounts Payable\Invoices\Validation” folder in Laserfiche and enters the invoice number and amount into the corresponding template fields. If the email subject includes a purchase order number, then Laserfiche Workflow performs a lookup into SunGard NaviLine to check if the purchase order is active. 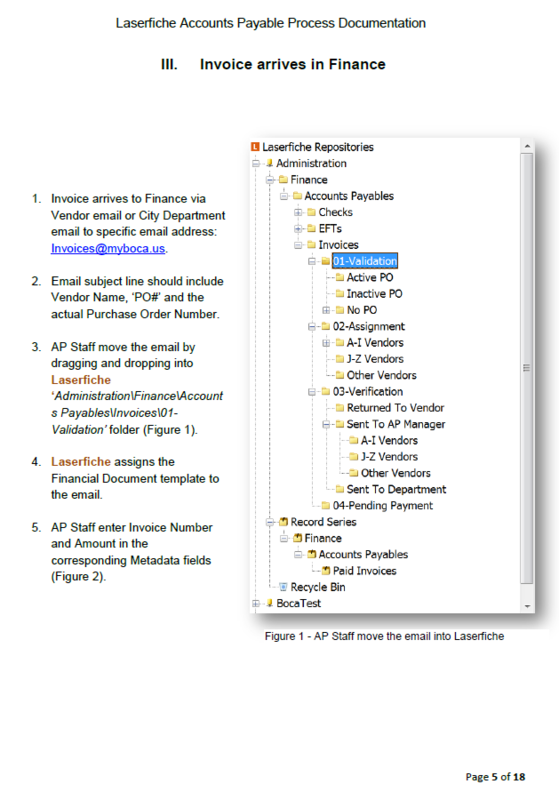 If the purchase order is active, Laserfiche Workflow creates a folder with the vendor name under the “Assignment \Vendor” folder based on the first letter of the vendor name. The accounts payable staff verifies that the goods and services have been received in SunGard. If the department has entered the receiver, the accounts payable staff selects the “Pending Payment” document status from the Finance Document Status field. If the staff member from the department hasn’t entered the receiver, then the accounts payable staff selects the “Sent to Department” status. 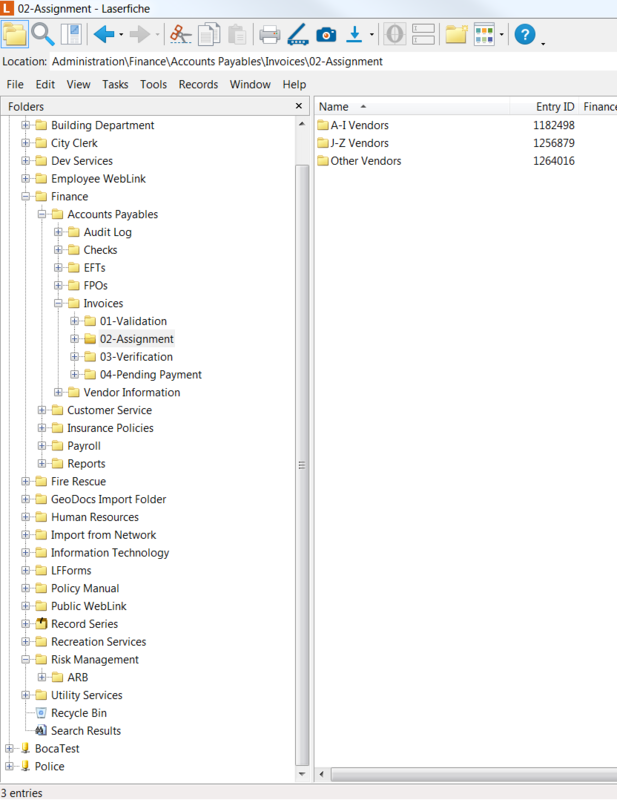 This triggers an email to the staff member requesting the receiver to be entered into the system and routes the invoice to the “Sent to Department” folder. When the payment is issued, a copy of the check or electronic fund transfer notification is imported into Laserfiche with Laserfiche Quick Fields and Laserfiche Import Agent. 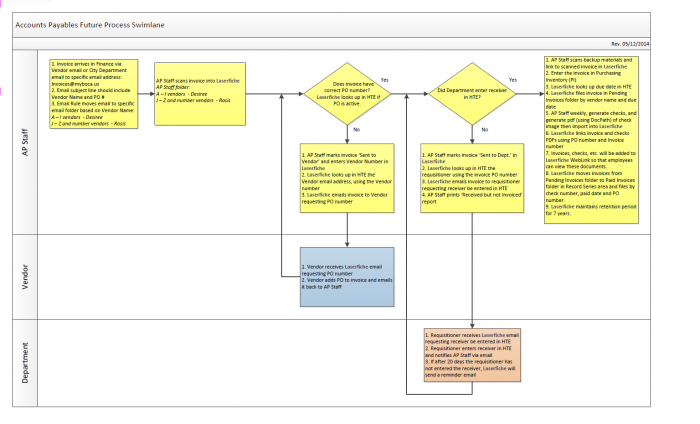 Laserfiche Workflow matches the payment with the invoice and moves both to a common folder in the record series area where it is organized by fiscal year and due date. 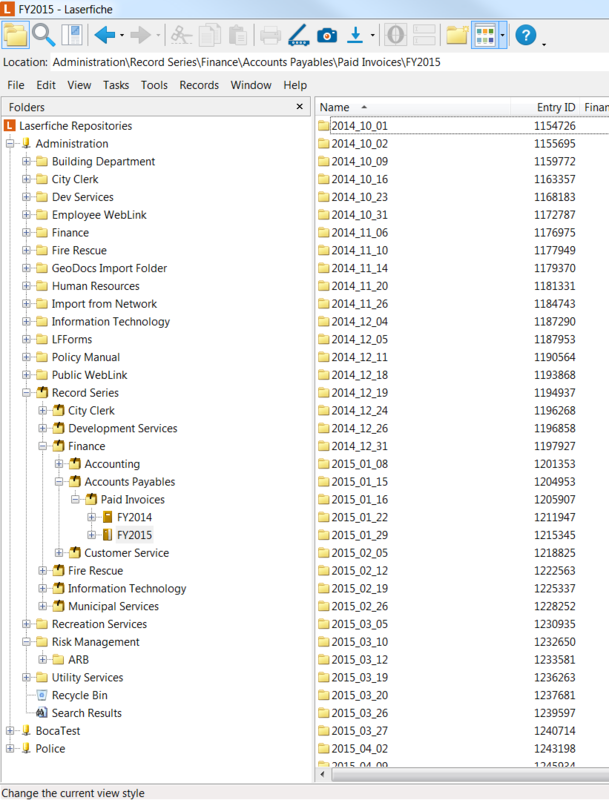 City staff can search for invoices through the Laserfiche WebLink portal. During the testing phase, the City had to redesign some parts of the workflow. For example, originally Laserfiche Workflow was sending an email to a vendor based on the information stored in the customer database. Not all vendors had an associated email address, so sometimes the email would not be sent. To remedy this issue, the workflow was redesigned to send the email to a central inbox from which the accounts payable manager routes it to the correct receiver. To train users, the Lean Team held training sessions and developed a step-by-step guide to the new process that included detailed instructions and screenshots. This guide is available to everyone through the company’s Internet portal. After training was complete, the City launched the process into production, making changes as needed. Processing errors have been greatly reduced since purchase orders are now automatically looked up in SunGard NaviLine and matched with appropriate invoices. The process is much faster since redundant (or non-value added) steps have been eliminated. Customer satisfaction has increased tremendously since all vendor information is now submitted through a single, electronic form. Lost invoices have been eliminated since the system tracks the invoice from the moment it is received through the approval process and onto the final payment. All documents including checks and backups are now centrally located in the Laserfiche repository. Each department can check the stage of its payments in the same system. 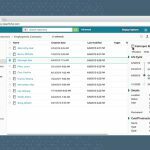 Do you want to automate accounts payable within your organization? Get the free guide today.